This morning saw Germany’s Business Confidence index rise to all-time highs. The Euro has hit one-year highs against the Dollar. Even as European interest rates are still negative, and the European Central Bank persists with QE. This is, of course, the point about the Eurozone. The ECB set interest rates for all countries within the Euro, not just Germany. Yes, Germany persistently runs surpluses, but hey, it’s propping up Greece now isn’t it, basically? That’s the deal of a monetary union. Oh but it’s not just an intra-Eurozone matter these days, now that DJT is in the White House. He hasn’t used the threat of calling anyone a Currency Manipulator yet – mostly because some of the key targets, such as China, are now allies required to fight a bigger enemy. But that won’t always be the case. Comparing the previous peak is instructive. That period of ECB QE was accompanied by a weaker Euro, as the inflows into those equities were hedged. That made sense – own the asset that’s rallying, but not the currency when it’s evidently being deliberately trashed. This time around, it really is different. 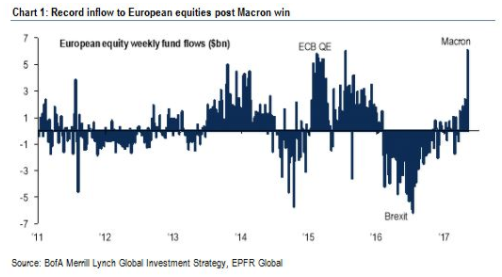 Not only is there a massive underweight European equity position that’s turning around, but the currency has fewer detracting forces than ever before. You may still question the value of a currency whose structure is an imperfect union. But the lessons of the last few years have shown, as Merkel herself said, that the answer to Eurozone crises is “More Europe, Not Less”. Now we have that German election to throw into the mix. The year began with a riot of headlines from across the German press, severely criticising the ECB’s policy. Bild screamed “Raise Rates Now” and SZ warned “Change Course Mr Draghi”. How will that translate in 4 months’ time when inflation, growth, confidence are all even higher? 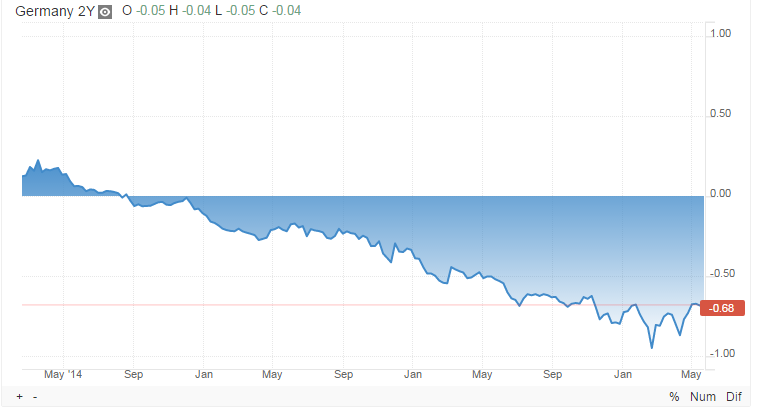 And 2 year German interest rates continue to be heavily mired in negative territory? The pressure on the ECB to move away from their stimulus will be intense. Already there are calls from Merkel’s MPs that the next ECB President must be German. To be fair, Italy, France and the Netherlands have had a go so far in the life of the Euro – and Germany would be a sensible choice during a period in which the EU and the Eurozone will be under even more pressure to reform, post-Brexit. We have a central bank that’s starting to use the sacred “taper” word…. The fly in the ointment for a stronger Euro will be how the market interprets the inevitable heat and light of Brexit negotiations. Does the UK storming out of talks hurt UK or European assets more? Or does 100bn EUR, and other EU27 demands, look so unreasonable that Europe is penalised? Or is it considered a sideshow unless the European economy itself wobbles? Whatever happens, the days of “the Euro is there to be trashed” are over. The Conservative poll lead is narrowing; halved in fact, according to one poll. That sounds perilous – but the reality is that they were so far ahead, a halving would still deliver a healthy majority. Maybe not the landslide 150 seats of early predictions; this latest poll would apparently translate into a majority of ‘just’ 46. It’s enough to stir Tory party jitters however. Financial markets appear disinterested, having decided that May calling the election means she will shore up her domestic power base, thus reducing the risk of a disorderly Brexit. With just two and half weeks to go until Election Day, this disinterest will soon ebb away. Then the real war begins: Let Brexit negotiations commence. The outcome of the election will determine just how much of a power base Theresa May really has. The wobble in their poll lead has been put down to the unpopularity of Conservative manifesto changes to social care – a policy that was allegedly inserted unilaterally by her powerful Chief of Staff, Nick Timothy. Without powerful outriders beyond her (explained well in this article by the excellent Robert Colvile), May could end up in ever more of an ivory tower. That’s fine if she can ensure party discipline. The ivory tower can centralise and magnify power as the negotiations progress. What if, heaven forfend, politicians become restless? So, no opposition. That means the Conservative Party can indulge in its favourite sport: self-immolation. Fighting itself to the death. That can be avoided in a period of relative calm, and ever increasing growth (cf. New Labour in the 2000s). No need to fight when there’s lots of money flying around, is there? (Although that didn’t ultimately stop Gordon Brown trying constantly to unseat Tony). But now, we have a subject that inflames passions. Our membership of the European Union blew apart the Tory Party in the 1990s, casting them into the electoral wilderness for over a decade. Could history be about to repeat itself? Added to this, we have the negotiation itself. David Davis is chomping at the bit to get into the ring. The Brexit negotiator has been giving plenty of pugnacious interviews, and this weekend remarked “We don’t need to just look like we can walk away, we need to be able to walk away”. As the EU put the finishing touches on their alleged 100bn EUR divorce bill demand, he noted that even 1bn would be “a lot of money”. What happens if he oversteps his hand? Will Theresa May fire him? What if her ivory tower becomes an isolated prison? What if public opinion becomes Brexit at any cost? Theresa’s election victory has already been played out in the markets, with Sterling’s rally from 1.2500 towards 1.3000. Now it’s time to play out who will be the victor in the real battle of the UK vs the EU27. Six days after the VIX prints a multi-decade low, it then spikes up to the month’s highs in the course of just a day. The one day move was the 8th largest in its history. This then prompted much gnashing of teeth about market mayhem, as Brazil’s stock market and currency lost the best part of 10%, words such as ‘impeachment’ were bandied around, and the 10yr US rate came within a whisker of hitting the year’s lows. Carry on carrying has been the motivation of markets ever since central banks forced it upon them. Never-ending cheap money was deliberately designed to pump up risky assets. It was designed to subdue volatility. It was designed to keep everyone in a safe space until the world was well enough to withdraw the methadone. That was all fine until…. Ah but it’s OK, because the global economy is back in action. Reflation is afoot, with China producer prices emerging from 5 years of deflation last September. The deflation demon has been slayed. So that’s all fine too then…? We don’t know, do we, which of these we really are fine with. It’s tricky. We are now entering a volatile period as these themes fight it out for dominance. So the carry motivation remains strong. As long as the world isn’t volatile, right? This has thrown a spanner in the predictability works for the last 12 months. But it’s Ok now, because all those pesky binary referendum/election events are over with aren’t they? Just the German election to get through, but the choice is Mutti Merkel versus the former President of the European Parliament, so no populism risks there eh? And in any case all these elections haven’t killed the markets or harmed their economies yet have they… so let’s just forget all about it. Then the risk of the US President becoming embroiled in criminal proceedings springs up. Just as he could rip up or sign up to a trade deal in a heartbeat. Or trip up in diplomacy with China or North Korea. Those risks can’t be ignored. Meaning that future volatility is definite, but unpredictable. Even Bernanke (remember him?) commented earlier this week, ‘It puzzles me that markets are very blasé about political risk until the last minute’. It shouldn’t puzzle him. He more than anyone knows that the market is obsessed with quantifying risk and then parcelling it away. But political risk is not quantifiable. This leaves the Carry trade in a Schrodinger’s Cat of a quandary. If we can’t measure the political risk, does that mean it’s not there? This leads to a debate over whether the Fed can really keep raising rates. Which leads to a question of whether carry can work. Which leads to a question of whether volatility can remain low. Which leads to a question of whether unquantifiable risks can be taken into account. 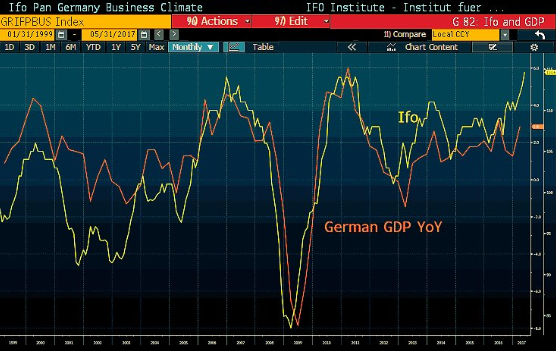 Which leads to a question of whether the central banks can keep withdrawing stimulus…. And so on. We are likely to try out all of these scenarios over the next few weeks as we break into a new framework for what is driving the market. Unfortunately that means the market will be fragile. Just as Cable suffered a big figure flash crash at random yesterday, we also saw the Dollar rally on a misinterpretation of a Comey video, and today the Taiwanese dollar gained over a percent on a simple restatement of the central bank’s currency policy. In this world, don’t get wedded to anything. You’re a businessman, or at least you’ve spent your life trying to cut deals. In fact, you made “You’re Fired” into a catchphrase. Let’s say you end up in a completely new leadership role. What do you do? Well, test out your new powers of course. Figure out where the levers are. You didn’t come this far in life without knowing how to make things happen, right? You decide you don’t like certain folks joining the club without being fully vetted. So you send all members a memo emphasising the criteria, pointing out anyone who doesn’t meet them can’t come in, for the time being. You decide you don’t like the reform whereby members didn’t need to wear jacket and tie anymore. So you decide to repeal it and replace it with something else. You have learnt that you can’t do this unilaterally, so now you shout at everyone to make sure this is implemented. You’ve got a bunch of new buddies you put into place in your leadership team. You keep them jostling for power as you’ve always done, by briefing against each of them to the others. So now, you’re frustrated, angry, irritated. You’re the head of the goddamn country club for chrissakes!! Why isn’t everyone doing as you say? I mean, you knew you’d have to bed in for a bit, learn the new scene, but not to this extent! It’s as if these people have a master other than you! Then one guy comes in. Starts poking around about a chat you had with a golf club maker. You wanted to do a deal, maybe get in some cut price clubs for the members. Something tangible, of benefit to the members. Something they’ll raise a glass in your honour for at the bar. This guy starts making trouble, asking questions, wondering if it’s all above the board. (Doesn’t he know I *am* the board??) So one day, you just fire him. Yeah, that’ll teach him. Throw him out into the cold. Who does he think he is? No-one will listen to him now, the chair of the club ditched him. Loser! Ah, but then you forgot that he was in charge of his own organisation. And it’s well respected. And it keeps records of events. And it’s listened to. And not just by the members of your club, or the wannabe members. But by everyone in the town. By your enemies. ……and the big question is not what happens to the head of the country club after all these misfiring spats; it’s what it does to the reputation of the club in the process. And of course, it’s way bigger than that. What if the club were the only club in the whole country? What if its credibility to operate were cast into doubt? This is where the next phase of the Trump Presidency gets into trouble. Not because someone is deliberately mad, bad or dangerous (although they may be) – but because governing with someone who is testing out government is going to end up testing the credibility of those institutions. And any loss of institutional credibility is going to end up creating a risk premium. 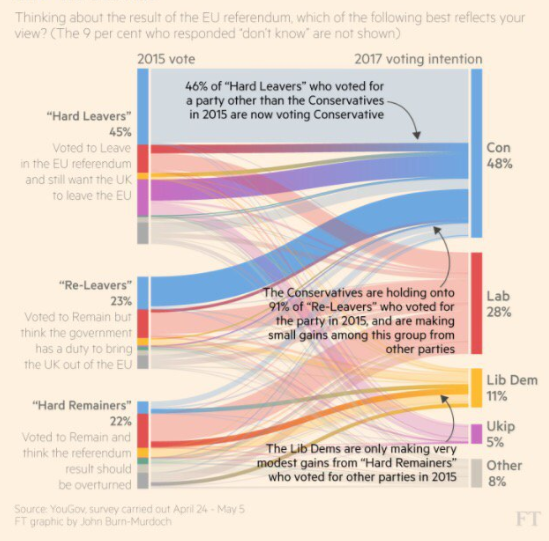 It’s not just the political risk associated with the one-off binary election risk that matters (was it ever?) for asset prices; but rather the requirement to take note of how governing actually happens. The market thought it could ignore Trump blundering around as he fiddled with the levers of power, deciding he was an impotent irrelevance. Now it’s starting to realise the entire process of government is powerfully important indeed. Let’s start with something esoteric. The Eurodollars options market has been having a little fun with the June Fed meeting. Having been priced in completely, the market is now “only” pricing an ~80% chance of a hike that month. This has come about despite low volatility, (allegedly) low political risk, tighter credit spreads, and basically any indicator that screams and shouts woohoo the world is allllright thank you ma’am. Usually a hike might get priced out because of fears the economy isn’t as great as first thought; or because the Fed themselves might guide it lower. Well, we’ve had Ok-ish data, and the Fed have been falling over themselves to continue to push out the hawkish boat. Former dove Rosengren is just the latest, telling us on Wednesday that ‘along with a gradual reduction in the level of the balance sheet, it would still be reasonable to have three rate increases over the remainder of this year’. Three! We’ve barely got 1.5 priced. 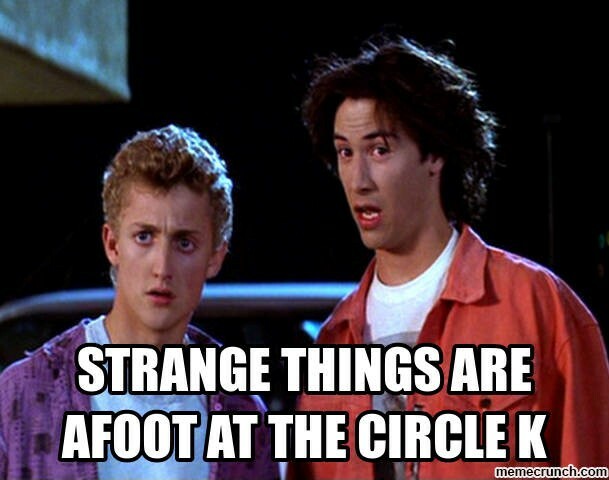 As BM’s great heroes Bill and Ted once spotted, strange things are afoot. The reason that the options market is playing around with that June date is because it’s a cheap way to get on a hedge in case the world goes wrong. If Trump does accidentally miscalculate over North Korea; or if France’s National Front suddenly capture masses of parliamentary seats; or if, heaven forfend, Labour’s Corbyn takes the UK back to the 1970s (hey, weren’t we outside the EU then too?)…. then you might want something in your portfolio that could capture it. These so-called tail hedges used to take the form of buying the VIX. But those using it as “cheap” insurance have come to find that astonishingly it’s not worth the paper it’s written on. The VIX keeps on going lower. After all these years of owning it, it not only fails to protect your portfolio, it actually ends up hurting it – as the persistent vol selling funds just keep on smacking it down lower. It’s not just that there was no point paying for the insurance because your house didn’t burn down; but that the world instead decides fires are now extinct and the insurance contract is worth less and less every day. Hence the need to find other ways to protect a portfolio cheaply – and hence the esoteric dive into the pricing of Fed rate hikes. Clever markets, eh? Always finding a newer, cheaper way to manage risk? Oh but this is where it gets reflexive, as Soros might say. We use prices to tell us things. The reason that everything looks so euphoric is because the prices are telling us that everything actually IS euphoric. The credit crisis taught everyone to look at prices they had never looked at before, in order to be ready in case something bad happened again. Equity guys didn’t use to give a monkeys about money markets: on a trading floor it was literally as if the former felt they were Ferrari-driving masters of the universe, while those mucking about in overnight deposits were pond slime. When the credit markets froze up in August 2007, it took another 6 months before equities stopped rallying. When everyone realised that if banks couldn’t lend to each other that was pretty bad for, y’know, the valuation of everything. So now, everyone looks at indicators like the LIBOR-OIS spread for signs of credit market stress, along with classic indicators of risk-off, like Emerging Market bonds, or that old favourite, the VIX. These are now all plumbing decade lows. That means everything is great! And these days, that means more than just being relaxed that nothing bad is going to happen. Just as we used them to warn us if things blew up, now they’re used to ensure max risk is on. All of the deliberate pumping up of asset prices through QE means the story of the last few years was to buy the dip. Don’t miss out – don’t leave anything off the table, go all in. If anything, the Brexit vote and Trump win only reinforced this; the dips were brief, despite the doom-mongers. This is partly because there is a genuine global trend towards reflation that is asserting itself despite the politics. But that could be derailed in a heartbeat by a change in policy. And where in the world right now do we have new untested leaders doing new untested things? The mistake here is thinking that political risk can be priced. Not all risk can be quantified. This shouldn’t be new for the market. Remember all those panicked CFOs during the crisis who pleaded it was a “six sigma event”? Something only supposed to happen once every 1.5 million years? We know now that the quantitative models were just wrong. So what if the current measurement of risk is also just wrong? What if using the prices from the market to put risk on is reinforcing those selfsame pro-risk market prices? What if the real risk is somewhere else? To conclude: what could the LIBOR-OIS spread tell us about the probability of the US President firing the head of the FBI and thus undermining the institutional credibility of the country that leads the free world? Get a Premium account to subscribe to Premium Insights for additional market information and guides.